Old Gortan Schoolhouse was built around 1880, as one of several schools constructed on Islay, to quite similar designs, following the passing of the Education Act in Scotland in 1872. This Act made education compulsory for all children between 5 and 13. The main schoolroom was in what is now our living room, and the windows in that room were placed deliberately high so that the children were not distracted by the beautiful views of Loch Indaal during their lessons! Old Gortan Schoolhouse functioned as a primary school until the 1970s. There is no shortage of people on the island whose uncles, aunts or grandparents were pupils at Gortan School! 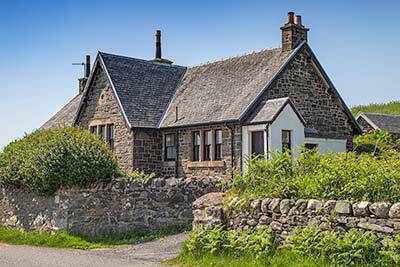 Today a Grade B listed building, Old Gortan Schoolhouse is a characterful cottage. Located just one mile outside the village of Bruichladdich with its progressive whisky distillery, the Schoolhouse boasts stunning views of Loch Indaal. From the dining room table or garden bench, you can watch the tide going out, seabirds coming and going, and gaze across to the Paps of Jura and the other side of the island. At low tide, you can even see the ribs of a ruined boat rising from the water – one of the many shipwrecks around Islay’s shoreline. With the gorgeous views and the cosy interior, you won’t want to leave the house! 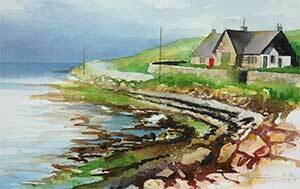 These are what make Old Gortan Schoolhouse “the cutest cottage on Islay”, according to local artist Dietmar Finger.